Southern Illinois University Edwardsville Provost and Vice Chancellor for Academic Affairs Denise Cobb, PhD, has named Tim Schoenecker, PhD, as dean of the School of Business. Schoenecker has served as interim dean since May 2016. SIUE School of Business Dean Tim Schoenecker. I am confident that Dean Schoenecker will continue to innovate and set the stage for continued excellence, partnerships and expansions both within his School and at the University level. 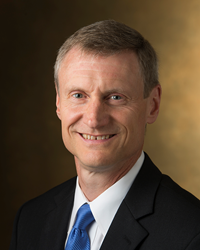 Southern Illinois University Edwardsville Provost and Vice Chancellor for Academic Affairs Denise Cobb, PhD, has named Tim Schoenecker, PhD, as dean of the School of Business. Schoenecker has served as interim dean since May 2016. The appointment is subject to SIU Board of Trustees approval. Schoenecker has provided significant service to the School as a collaborative leader. He, in close partnership with faculty and staff, has contributed to the School’s growth and celebrated its accounting and business programs’ 2017 reaccreditation by the Association to Advance Collegiate Schools of Business (AACSB), a hallmark of excellence earned by less than five percent of the world’s business schools. Provost Cobb extends her thanks to the search committee and its co-chairs, Anne Powell, PhD, and Ram Madupalli, PhD, and commends their choice. Under Schoenecker’s leadership, the School has progressed its strategic plan by boosting enrollment, continuing its tradition of internships and global engagement, building faculty resources and maintaining its momentum in development and alumni relations. In March, the School recognized record donor support with scholarships worth more than $200,000 presented at its annual scholarships and awards program. Schoenecker notes the School’s chief priorities going forward will include successfully implementing the curricular changes and growing graduate enrollments. Schoenecker previously served as interim dean for the School in 2007 and 2008. Prior to that role, he served as associate dean for academic affairs for more than four years. He has provided leadership at the University level as chair of the University Planning and Budget Council and chair of the steering committee for the chancellor’s ad hoc University Congress. Schoenecker joined the SIUE faculty in fall 1992 in the Department of Management and Marketing. His teaching interests are in the areas of strategic management and entrepreneurship. His research interests are primarily in the areas of corporate governance and top management teams. In addition to his academic work, he served as a consultant for both large and small businesses in the St. Louis area. SIUE’s School of Business and the accountancy programs are accredited by the Association to Advance Collegiate Schools of Business International, representing the highest standard of achievement for business schools worldwide. The Princeton Review lists SIUE as one of the top 294 business schools in the U.S. for the 11th-consecutive year. Undergraduate and graduate degrees are offered in accounting, computer management and information systems, economics, finance, management and marketing. More than 27,000 alumni have earned degrees from the SIUE School of Business. For more information about the School of Business, visit siue.edu/business.